I was hoping to have finished Vogue 1247 by now. I am in the home stretch, but stretch is the optimal word. Last minute impatience had me rushing to finish the sleeve cuffs and hem, this has led to some wonky and ripply edges. I’m taking a break to return when Little Miss Impatient is asleep (er, that’s my brain, not an actual child or anything…). From somewhere I seem to have become obsessed with tops and skirts masquerading as dresses. I first became aware of this phenomenon from vintage patterns, where things I would call a two-piece seem to be called a dress. Then there came the much-made peplum combo from Burda Aug 2012. You would think this is dress. Fooled again! It’s a skirt/top. I wanted to make that skirt/top so badly. I think it was about that time that a small neuron stuck up its dendrite and suggested ever so quietly that, even better, if I made two, I could mix and match them, the skirt from one with the top from the other. Might I still do that? Well, maybe… there’s a piece of black hound’s tooth that’s got peplum written all over it. But the turqoise linen is getting made up into a two piece peplum. right. now. So to meet the requirements of the challenge without looking like a great big peplum weirdo, my plan is to take one of the other fabrics and make both a skirt, which can also be matched with the peplum, and a second top of a different design. That way all four items will co-ordinate with each other, but I still get to indulge in the skirt/top masquerade gimmick, and I’ll have two different looks. I know! However, (and it’s always more complicated when my brain gets involved), back to the actual Burda pattern, I decided, after reading Fehr Trade‘s review, that I would want to swap the bodice for something else. Various plans ensued: redraft the supplied bodice by manipulating the waist dart into a princess seam; use the top half of the wiggle-dress from Gertie’s Book for Better Sewing; oh, wait, what’s that weird non-pattern at the start of Pattern Magic 2? 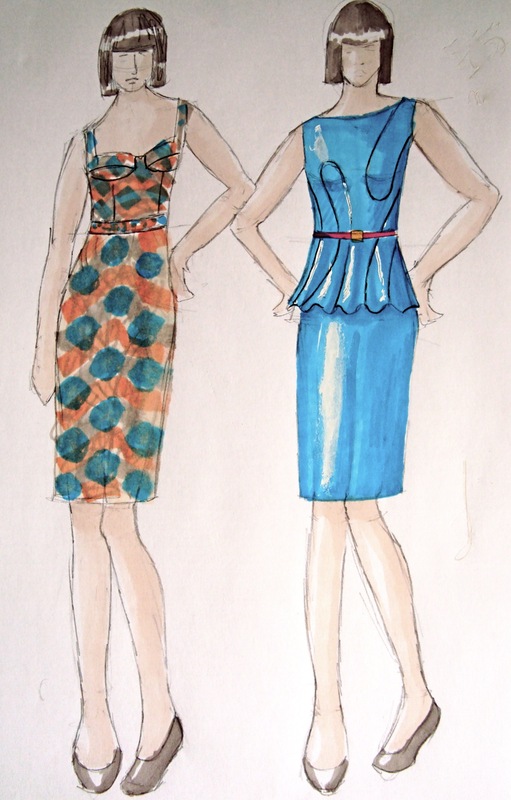 So, without further ado here are my initial designs for the turquoise linen/silk blend and African wax fabrics. I’ve tried to find an on-line example of someone making this, but it seems that most people did what I did initially and skipped over it. The only reference I can find to making this top is in a post, again by Fehr Trade, describing a course she took at Morley College. They’re doing another one this year, look. 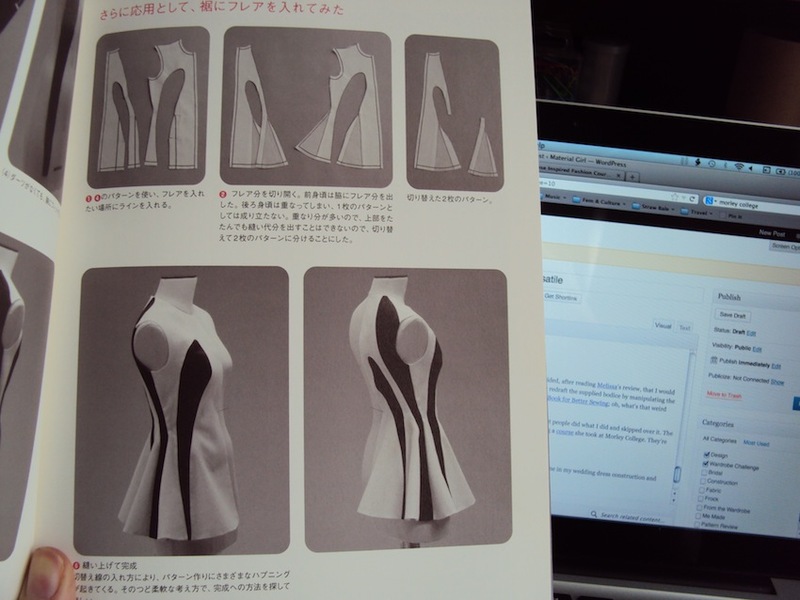 So you’ll just have to look at my grainy photo and the shaping lines in my design illustration, until I show my pattern. This also ticks off one of my challenge aims: using some instructions from the Pattern Magic books. I’m getting excited about sewing my peplum a year after the trend hit, although, there are some who are, apparently, ‘over’ it already! I don’t care! I like your idea of making a set of mix and match top and skirts. Clever. And your design for the African wax cotton looks lovely. That kind of bold pattern will look lovely in the bustier type bodice you’ve sketched. Thanks! I hope it won’t end up looking too broken up by the lines. Although that might be interesting. I’m hoping to use the top from the Gertie Bombshell dress class.